Next to paint, glue is the 2nd most commonly utilized product which we as hobby enthusiasts go through. CA glues are the ones we as wargame hobby enthusiasts use the most. I'm quite familiar with just about all of the options available out there at present. At one time Zap-A-Gap was my CA glue of choice. In recent years I've learned that the biggest name brands aren't always the best products for the job either. One thing is for certain, the biggest name brands are almost always the most expensive. A lesser known product, but one I'm very familiar with now is the Insta-Cure + CA-based glue from Bob Smith Industries, Inc (BSI). I happened upon this stuff totally by chance. I was at a local hobby shop one day to get a specific shade of paint I needed. When I made it to the checkout, sitting at the counter was a display filled with what looked like some generic off brand of CA glue I had never heard of. I knew I was almost out of Zap-A-Gap, and looked at the almost $5 price tag of the Zap-A-Gap behind the counter, then proceeded to ask the owner about this display at the counter. The shop owner said it was just as good, or better than Zap-A-Gap, and that they sold a ton of it, because it cost less. This little bottle of Insta-Cure + even had the name and contact info of that specific hobby shop printed right on the label. I thought that was kinda cool. I believe I paid only $3 and some change for that ½ oz bottle, which I thought was more than fair. Once I arrived home I began working on an Ork army I was building at the time. I realized in no time that the Insta-Cure + was just as good as the Zap-A-Gap MV I had been using all along. It offered a solid bond, the glue dried fairly quickly, and I used that bottle until I couldn't get another drop out of it. They had me sold at that point. This is the thinnest product that they have to offer. They claim it has a drying time of 1-3 seconds, and after having used it, I'd have to agree with that statement. This is water-thin, and wicks well deep into cracks. 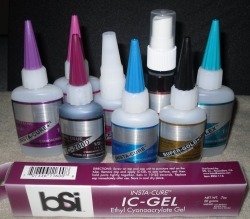 All of the BSI products are easily recognizable by the color of the labels, and this one is metallic blue. This product comes in ½ oz, 1 oz, 2 oz, and even a giant 8 oz bottle. It's also available in a PocketCA 3/4 oz bottle. The bottle itself hard plastic, and the tip has a rather long cone shape to it, being the smallest at the tip. To open the bottle you must cut the tip off. The cap simply snaps onto the bottle, so there's no threads to gunk up with CA. There's definitely room for improvement here. They do have a better bottle design, which is what they use for their PocketCA line. The PocketCA bottle is essentially a ¾ oz bottle, with a pin inside the screw on lid, which keeps the bottle tip clear from clogging, and keeps the bottle from spilling CA all over the place if tipped over. While the PocketCA tip isn't as thin as the regular bottle design, it's a better bottle design overall. Others have figured out how to offer a thinner tip design with a no clog pin inside the cap too. With a little refinement the PocketCA bottles could be even better. This is a unique product. Insta-Flex is not quite as thin as the Insta-Cure, but it can wick well, and is by design meant for hinging since it offers a flexible bond once dried. Most other CA glues dry hard, and can become brittle if you try to flex the bond. Insta-Flex isn't as strong smelling as most other CA glues either, as this is a low odor product. Bonding time is said to be 2-5 seconds, so it's a hair slower than Insta-Cure. This product comes in a 1oz bottle, with a metallic aqua colored label. This is the product I'm the most familiar with. This is a medium viscosity product, so it's the ideal gap filling CA. Curing time is 5-15 seconds, so it's a bit slower than Insta-Cure. It offers a solid bond, and I'd have to say that about 10 seconds is the average bonding time, unless you mess up and use too much. This is by far the most versatile product in the entire range, and is the product I'd recommend over Zap-A-Gap MV any day. This comes in 1/2 oz, 1 oz, 2 oz and 8 oz bottles, and has a metallic purple label. It's also available in a PocketCA 3/4 oz bottle. This is the thickest of the liquid CA products they offer. It even says Extra Thick on the bottle. It claims a 10-25 second drying time. I'd say it's closer to the 25 seconds. It also says Plastics & Hardwoods on the bottle, and they claim it bonds fiberglass, plastics, metal, hardwood and rubber better than any other adhesive out there. Once dried it can be sanded, filed, and even sculpted. They also claim this stuff works great for bonding tires to R/C vehicles. Maxi-Cure comes in 1/2 oz, 1 oz, 2 oz, and 8oz bottles, and has a metallic red label. It's also available in a PocketCA 3/4 oz bottle. It says Tire Glue on the bottle, and it's a black liquid. This is BSI's rubber impregnated CA. This is the stuff you want to use when you need a strong, but shock resistant bond. They also claim it works well on non-porous surfaces, and the bonding time is 20-45 seconds. IC-2000 can be used with their Insta-Set accelerator to speed things up a little as well. They also claim it works on all kinds of metals, carbon fiber and other advanced materials. IC-2000 comes in ½ oz and 1 oz bottles. This is another rather unique product. This is a CA adhesive in paste form. By design this stuff can be used vertically, and once it's in place, it won't run. It comes in a toothpaste-like tube, and you need to be careful, because it tends to keep coming out of the tube once squeezed. Therefore you do stand to waste it if you're not careful. They claim it sets in 10-25 seconds, which for as thick as it is, that's quite fast. You also need to puncture the tip, and then screw the applicator tip in place to use it. This is more like a paste-like putty, and can be used as such for filling large gaps. This is their 100% foam safe, and odorless CA product. They claim it has a slightly weaker bond than average CA-based solutions, but if you're allergic to standard CA glue, or have no properly ventilated space to use standard CA glue, then SuperGold + is the best alternative. One advantage is that this stuff won't fog up clear plastic like standard CA glues. So this is an ideal product for gluing clear plastic canopies to fuselages. This product comes in 1/2 oz, 1 oz and 2 oz varieties, and features a metallic gold label. It's also their most expensive CA adhesive. This is their accelerator option. This is a catalyst, which happens to have a strawberry scent. In the past I was against accelerators, because some tended to offer a slightly weaker, or more brittle bond. BSI claims Insta-Set won't degrade the strength of the CA adhesive bond at all, and that it will help cure most CA glues in 6-8 seconds. It's also safe to be used on foams. Insta-Set comes in a 2 oz spray bottle, and in a huge 8 oz bottle as well, and features a metallic brown label. Bob Smith Industries have been at it since 1983 making epoxies and CA adhesives. They're definitely no stranger to the market. The only thing that sets the BSI CA adhesives apart from Zap-A-Gap and many of the other alternatives is cost. 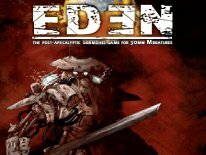 They make solid products, which work as advertised, and they're able to do so at a price-point that most hobbyists can afford. On average you can get a 1 oz bottle of Insta-Cure + for $4 USD, where as you'll pay close to that much for a smaller 1/2 oz bottle of Zap-A-Gap CA. Even a 1/2 oz bottle of Insta-Cure + is a little under $3 USD, where as a 1/4 oz bottle of Zap-A-Gap will set you back the same price. The Insta-Cure, Insta-Cure + and Maxi-Cure in 2 oz bottles are roughly $7-$8 USD, which is almost what you'll pay for a 1 oz bottle of Zap-A-Gap too. As you can see the BSI CA-adhesives are literally half the cost of Zap-A-Gap, and perform equally as well, or better. Some of the other specialized products cost more though, but this is expected. For instance a 1/2 oz bottle of the rubber impregnated IC-2000 will set you back about $4, which is about $1 more than the non rubber impregnated CA from BSI. The SuperGold+ formula also doesn't come cheap. A 1/2 oz bottle of SuperGold+ runs about $6, so it's a lot more expensive than all other standard CA alternatives I can think of. On the flip side other odorless, and foam compatible CA adhesives don't come cheap either. The .7 oz IC Gel will set you back about $5.50, which isn't bad. The Insta-Set is also reasonably priced at roughly $4 for the 2 oz pump-spray bottle. Lastly the 3/4 oz PocketCA bottles run a little under $4 per bottle, which again is quite reasonable for a bottle you can throw in your toolbox, or in your pocket and not have to worry about it spilling, and wasting it. All of the labels on their CA products have a blank spot on them for a hobby shop to include a small label of their own with their name, address and phone number/website, etc. That's a stroke of genius if you ask me. The standard bottle that they use is the only thing I could gripe about. It's not the best design, but for the price I can deal with it. The PocketCA bottle cap and tip is a much better solution all around, and if only they'd modify it for a thinner tip they'd really be on to something. The Insta-Cure + is by far the most versatile product they make, and I'd recommend it over most any other option out there today, because it's a damn fine medium viscosity CA adhesive, and it cost less than the majority of the competition's products out there. If you need a thinner alternative, the regular Insta-Cure will do the trick. If you're looking for a shock resistant bond, the IC-2000 rubber impregnated CA should do the trick. I can see IC-2000 coming in handy for a Warmachine warjack which has to balance on one leg, or has such a crazy pose, that even pinning and regular CA glues just aren't cutting it. I see the IC-2000 as one step down from an epoxy, but a step above the thickest CA, with a solid bond, but also the means to give a little. I also found the Insta-Set to be very useful. I like that it doesn't stink like chemicals, but that it helps speed up the curing process without weakening the bond. 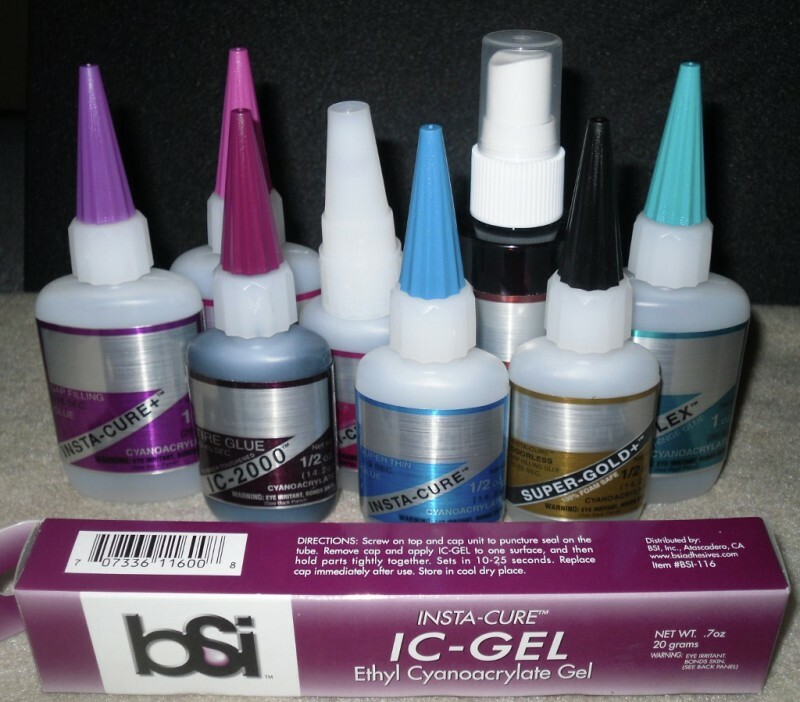 If you're a wargaming hobbyist, no matter what the job may be, chances are BSI has a CA-adhesive to get the job done. What's more, all of their products are readily available here in North America, and in most cases, they're half the cost of Zap-A-Gap, and extremely cheap in comparison to some of the other alternatives floating around out there.